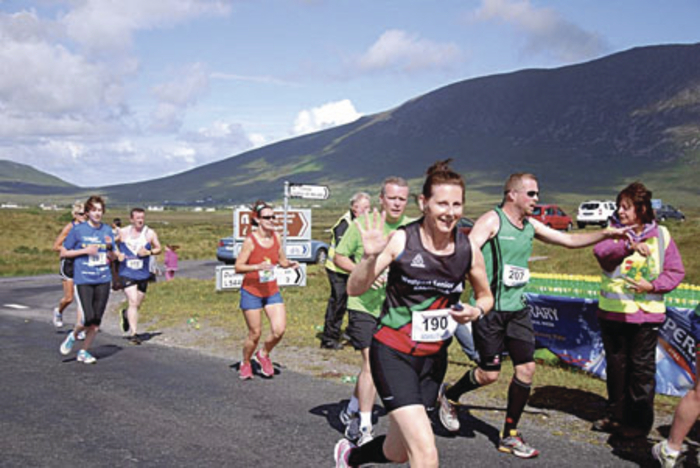 Runners enjoying last year’s Achill Half Marathon. Photo: Achill Tourism. Fun running just keeps on growing in popularity with scores of events now taking place at any time throughout the country. However, one running event which still stands out from the crowd for many is the Achill Half Marathon and 10k, now in its ninth year. The event is well recognised for its stunning, coastal scenery and also for the warm island welcome which participants experience. This year’s Achill Half Marathon takes place on July 4 and will be filmed and broadcast on Irish TV, who are media partners for the event. The event has grown from strength to strength since its launch in 2006. In it inaugural year, 300 hardy souls took on the hilly challenge but now the entry has grown to such a size that organisers have this year capped the numbers at 1,200 for the half marathon and 800 for the 10k. Fans of the event are advised to book early to avoid disappointment. As this year’s Achill Half Marathon coincides with America’s Independence Day, Achill will also be celebrating its close ties with its Stateside twin, Cleveland in Ohio. “It will bring a special meaning to the day for our friends and family aboard who can look forward to the Irish TV screening later this year,” said committee spokesperson Noel Stenson. The charity partner for the race this year is the Irish Cancer Society. The event is open to runners and walkers of all abilities, from seasoned runners and club members, to beginners who can run or walk. The course is set against the magnificent backdrop of the Wild Atlantic Way. The half marathon starts at 10.30am and the 10k race starts 30 minutes later at 11am at Keel Sandybanks. The registration HQ will be open from 2pm on Friday July 3 or from 7am to 9am on the day of the race. For further information, visit www.achillmarathon.com; telephone (098 ) 20400 or email [email protected].